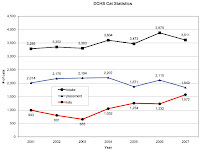 No Kill Madison: DCHS cat-graphs updated - holy crap! DCHS cat-graphs updated - holy crap! there is no point in doing much more than just showing the damn slide. it looks considerably worse now that we factor in the kills that appear in the September/October data unavailable as of our November update (you read that right). either way, we're on-track to kill over 40% of the estimated 3,600 cats DCHS will have taken in by the end of 2007. woot. it's dark math, we'll agree. but it's the math that matters if you are a free-roaming cat in Dane County, the most at-risk group. we are specifically advocating on behalf of those cats, for sake of clarity. we'll put up the intake, adption, and shelter-kill data that helps us arrive at save-rate (adoptions are actually not a direct factor in save-rate, but obviously tightly linked). I know that I have stopped contributing financially to the killing at DCHS. Until they change their policies, they will not get a dime of my hard earned money. I am sickened and saddened by the the information you have uncovered. Thanks for sharing the truth. I hope that the folks in charge of DCHS can get their acts together and change to NoKill. What is so hard about that concept for them??? could someone enlighten me? whats the push for a no kill shelter for?